Squash House Quilts: Do You Frisper? & Some Sewing! Remember Chicky-Bee? She and I are getting along famously! My favorite feature is the fact that she stays on for 30 minutes before automatically shutting down! The nice folks at Oliso really got this right! Recently, another wonderful item from Oliso arrived at the Squash House - The Frisper vacuum sealing freshkeeper! This Frisper Pro-1000 model is just perfect for Mr. Squash and I. Being that there are just two of us, we tend to have a lot of food waste. It's been better since we retired, but still a struggle. Plus, we might just be keeping a fish or two this year rather than releasing them once we get into Steelhead season and it would be nice to be able to seal them tightly so we can cook them later. I thought I would give you a little demo of the Frisper. I tried to make a little video, but there seems to be some sort of " anit-electronic Karma" in our area today - nothing is working as I'd like, so I'm sort of winging it! This is what the Frisper looks like. Click on the picture for a couple of notations I made next to the arrows. One of the items our area of the country is famous for is asparagus. We bought some at the Farmer's Market this weekend. 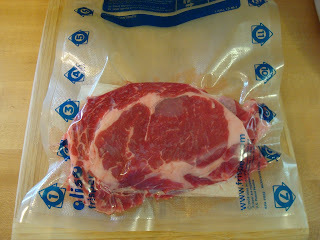 Below you see I placed it in a Frisper bag, zipped the bag closed and picked out a sealing circle to use. The bags that come with the Pro-1000 can be sealed up to 10-12 times by simply washing the bag after each use and picking an unused circle! I placed the sealing circle into the Frisper on the "moist" setting and it automatically took all the air out of the bag! Now it should be as fresh as the day we bought it when I use it this coming weekend! 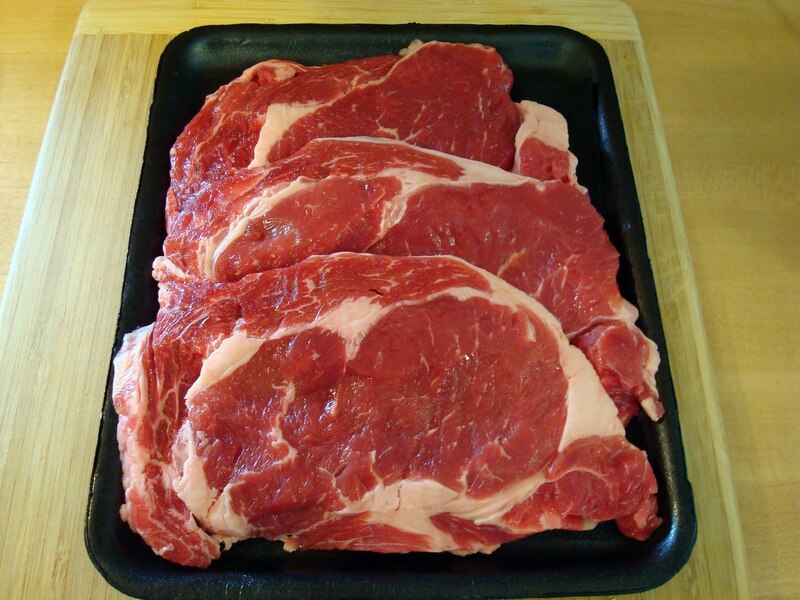 We like to grill steaks from time to time, but I prefer a very thin cut of meat which is often hard to find. 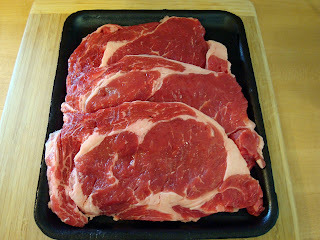 Well today we found a package of thinly cut rib-eye steaks - perfect for me! 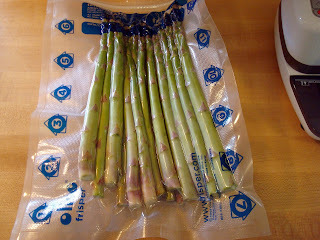 I thought they would be great for the Frisper - freeze them all together, then pull out as needed and re-seal the bag! I placed a piece of parchment paper between each steak so they would be easier to remove one at a time. Here they are below all sealed and ready for the freezer! After each bag is sealed, the Frisper tell you it's done by beeping twice and lighting up the "Done" button! No guesswork needed here! There are many other uses for the Frisper - including sealing wine and fresh olive oil in bottles! There is a winery here in town that also makes fresh olive oil. I'll show you how to seal that in another post. 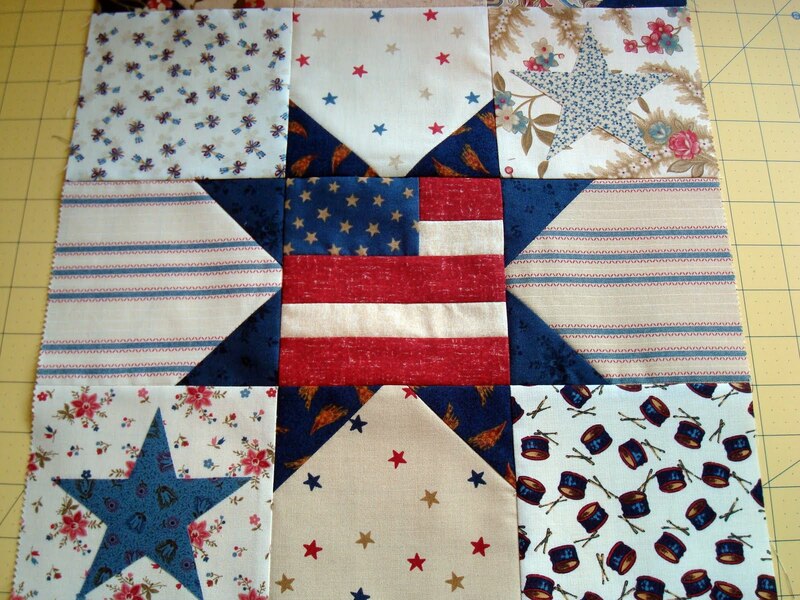 I've been staring at a pile of leftover charm squares from Looking Back, Antique Americana and Flag Day Farm for a while, so I thought I would whip up a tablerunner for July 4th. The color palette in all three lines is very similar, so I thought I would experiment with combining them! 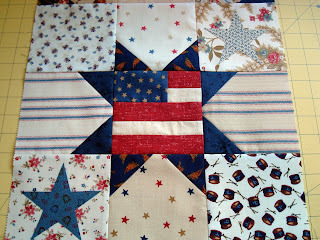 Here is a preview - I have yet to stich down the stars, add the border and binding, then quilt it. It's been raining cats and dogs, so maybe I can get this done by the weekend! I always feel so guilty about food waste. Things do spoil so quickly. Really liking your flag block. LOVE Cy. This looks very interesting - hmmm! We seem to waste a lot of food too. Just the two of us and way too much food; we're getting better, though. Love the patriotic star - sweet! Your star block is wonderful! Now that I am on my own during the week, I should look into storing my meals in small portions with a Frisper system. Clever Way to keep food fresh! We enjoy the asparagus season as well, but ours is imported from Central Europe. Your quilt block is beautiful and the fabrics are lovely. I hate throwing things away from the "rotter"(as opposed to the crisper!) but have not considered getting a sealer as yet. I was curious why you were going to seal the patriotic block, but silly me, you didn't! 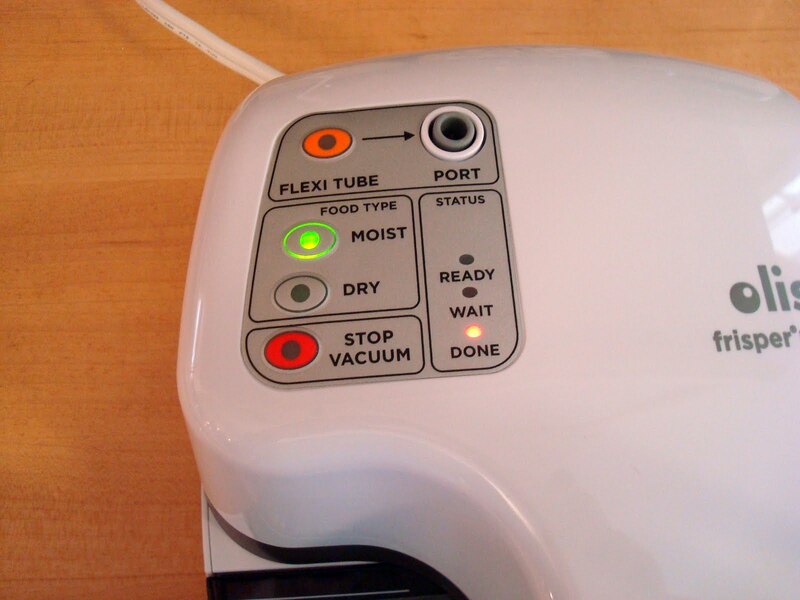 I need to check out that Frisper. I really need a July Fourth table runner too - you have inspired me to dig for fabric. I'm going to have to look into that Fisper! Wow. And the table runner is going to be adorable! Love the patriotic block! WOW, that holiday is right around the corner!! We have a food saver which I love but we don't use often enough. We waste a lot of food too and we should do better. I love your patriotic block. Putting the flag in the center square is brilliant!